Nepaliaustralian’s Blog Awards celebrates the best in blogging with 14 winners being announced at early 2014. More and more people are reading and writing blogs to write about their passions, to further their businesses, and to share their personal experiences and their projects. Personally, I know so many blogs that have helped me to learn and understand different things in life so I want to celebrate all these blogs with these award. Please nominate your favorite blogs in following categories. Any pages with dated entries that existed at some point during the year 2013 are eligible. Only one nomination from one person per category. You can nominate same blog for multiple categories. Please leave comments with your nominations as below. Your comment won’t be visible to anyone. Nominations close on 30 November 2013. After nominations close, I will post the top 5 blogs in each category and you can vote for them. The Blog Award will be announced in January 2014. Also add the image below with the link on the side bar of your blog so your reader can click there and reach this post to nominate you. This entry was posted in Nepaliaustralian Blog Awards and tagged awards, Best Blog Design 2013, Best Blog for 2013, Best Blog Post of the Year 2013, Best Fashion Blog 2013, Best Fashion Blog Post 2013, Best Food Blog 2013, Best New Blog 2013, Best Personal Blog 2013, Best Photo Blog 2013, Best Photo Blog Post 2013, Best Travel Blog 2013, blog award, blog awards, Most Diverse Blog 2013, Most Educational Blog Post 2013, Most Witty Blog Post 2013, Nepaliaustralian Blog Awards, Nepaliaustralian's Blog Awards, personal blog. Bookmark the permalink. I’ve explained in previous awards why I appreciate the award nominations from my fellow bloggers. 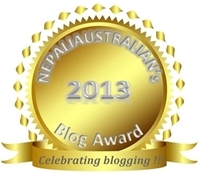 I am throwing my proverbial hat in the ring for a Nepaliaustralian Blog Award. I will explain the why a bit later 🙂 Namaste, ya’ll …. Phew! That’s gonna be a lot of reading 🙂 Good thing you gave us until November.